Last week’s snowstorm brought some beneficial moisture to the front range and it looks like we are on track to possible get more as we look to an unsettled week ahead. We are tracking two storm systems this week, one late Tuesday into Wednesday and another sometime next weekend. As expected for this time of the year, models are bouncing around quite a bit, even on the storm Tuesday/Wednesday. I’ll discuss mainly the mid-week storm in this post, but will have a look at the weekend’s possible storm later this week as it’s still a bit early to look into that particular setup. 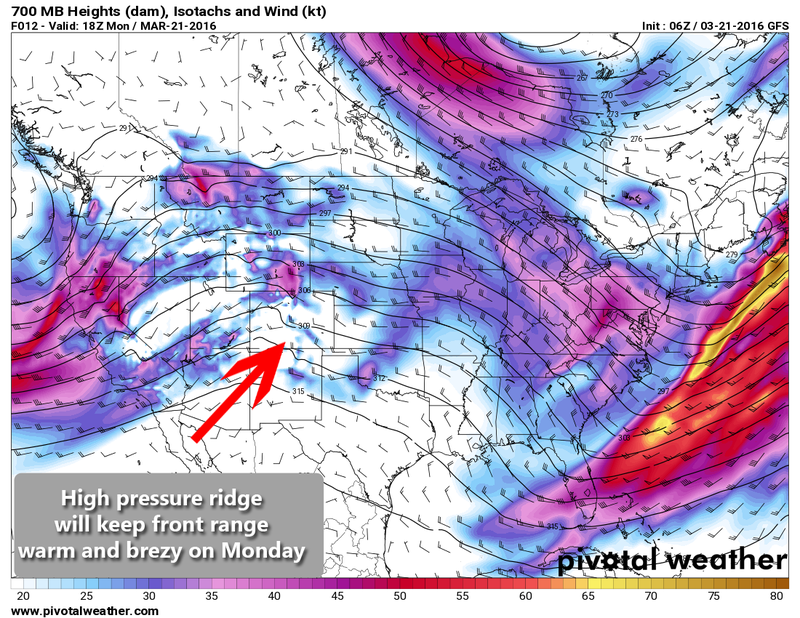 A high pressure ridge that begin building over Colorado on Sunday will continue to dominate our weather on Monday and most of Tuesday. 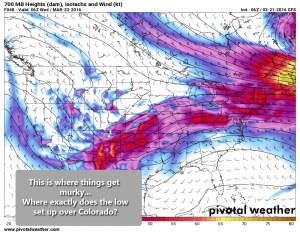 This means Westerly and Southwesterly down-sloping winds will keep Colorado’s front range very warm and breezy throughout both days. Expect temperatures in the 70’s on Monday and in the mid 60’s on Tuesday. 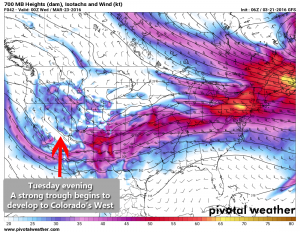 As we move into Tuesday evening, things begin to change to our west, this will mean windy conditions along the front range as our storm system begins to set up over the Great Basin. 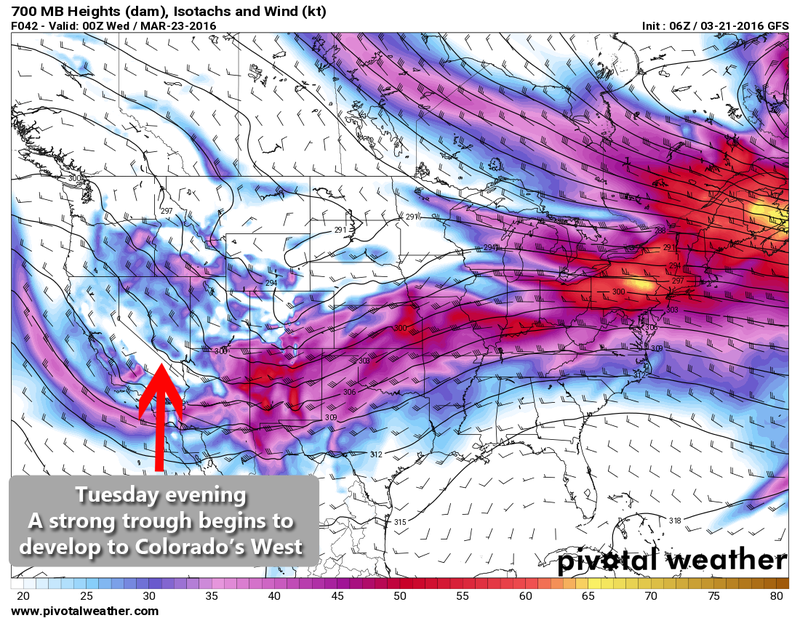 GFS as of 11pm Tuesday night, the storm begins to take shape over Western U.S. 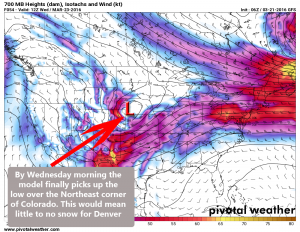 So you would think this is pretty open and shut and we should not expect much of a storm on Wednesday for Colorado’s front range… then along comes the EURO model. 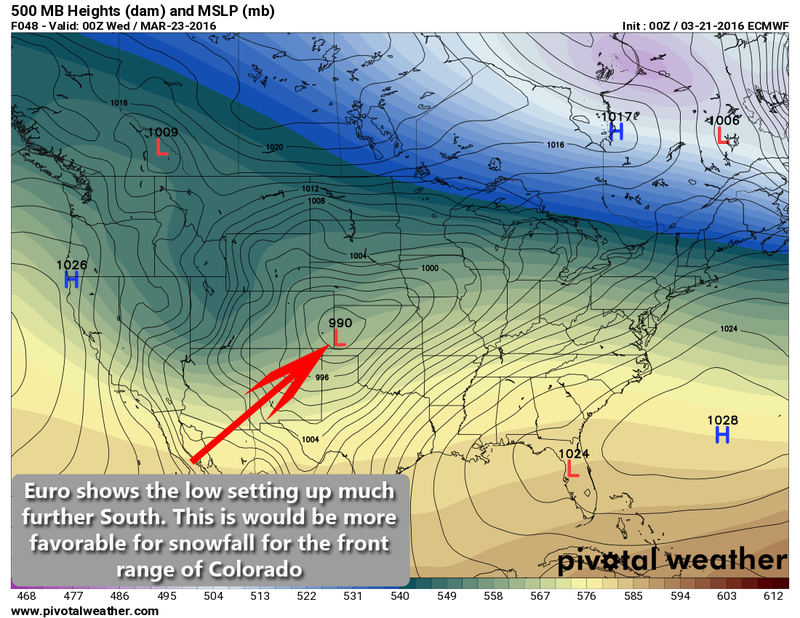 This model has been extremely accurate this year, much more so than some of the American and Canadian models. I’m not ready to post any snowfall totals just yet regarding this storm because models still don’t have a good grasp on how this storm system sets up. 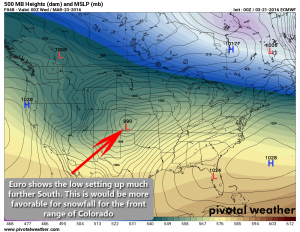 Until you have a better idea of where the low sets up, you can’t reliably start forecasting snow. I know the TV stations will start to jump on this and spit out some snow totals but please take all of that with a grain of salt. At this time the storm is still 50/50 between something significant (blizzard type spring snowstorm) and nothing at all. I’ll be posting quite a few updates on this storm today and Tuesday as we should get a better idea of what this storm is doing as more data comes in. Please stay tuned for updates as I’ll relay any information as the forecast changes. Keep a close eye on this one if planning travel late Tuesday and all day Wednesday. Be prepared to adjust plans if this storm comes together.